A casserole, from the French word for "saucepan", is a large, deep dish used both in the oven and as a serving vessel. The word casserole is also used for the food cooked and served in such a vessel, with the cookware itself called a casserole dish or casserole pan. In British English, this type of dish is frequently also called a bake, coinciding with the cooking technique used to cook casseroles. 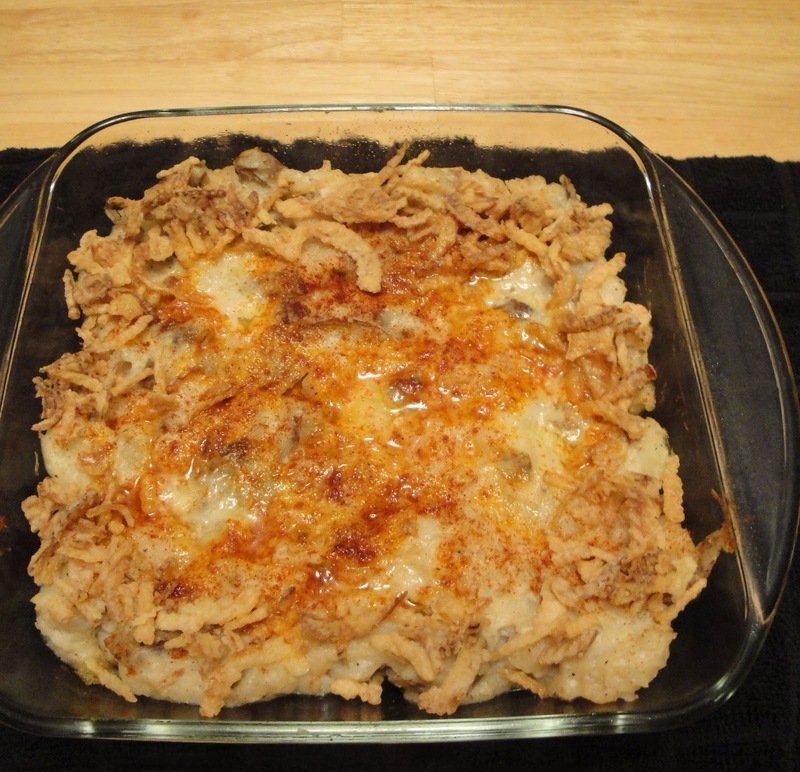 In Minnesota, this type of dish is sometimes called "hotdish." Casseroles usually consist of pieces of meat (such as chicken) or fish (such as tuna), various chopped vegetables, a starchy binder such as flour, potato or pasta, and, often, a crunchy or cheesy topping. Liquids are released from the meat and vegetables during cooking, and further liquid in the form of stock, wine, beer (for example lapin a la Gueuze), gin, cider, or vegetable juice may be added when the dish is assembled. Casseroles are usually cooked slowly in the oven, often uncovered. They may be served as a main course or a side dish, and may be served in the vessel in which they were cooked. Types of casserole include ragout, hotpot, cassoulet, tajine, moussaka, lasagne, shepherd's pie, gratin, rice or macaroni timballo, and carbonnade. A distinction can be made between casseroles and stews: stewing is a cooking process whereby heat is applied to the bottom of the cooking vessel (typically over a fire or on a stove), whereas casserole cooking is generally done in an oven to bake where heat circulates all around the cooking vessel. Casseroles may be cooked covered or uncovered, while braises are typically covered to prevent evaporation. Casseroles are great for family gatherings and potlucks. In a pot, place chopped potatoes, cover with water and add pinch salt, cook until tender. Drain potatoes and place potatoes back into pot, add salt, pepper, onion powder and 2 tablespoons butter, mash. Stir in cream of potato soup. Place potato mixture in a greased 8x8 baking dish. Dot with remaining butter. Sprinkle paprika. Place French fried onions around edge of dish. Place in preheated 350 degree oven. Bake for 20 minutes. Enjoy! It looks very flavorful, cant wait to bake this. So delicious and comforting. I won't need a plate, just give me the casserole dish and a spoon! Hi there. The current Food on Friday is all about potatoes, sweet potatoes and kumara! So it would be great if you linked this in. This is the link . Have a good week. love potatoes!! This sounds yummy!! I just know these are pretty amazing! My peeps will love!! Always good!! Love this one!